Bret and Brandon first contacted us about photographing both their engagement session and Kempker’s Back 40 barn wedding last spring. After chatting, I knew our style of photography would be a perfect fit with their vision! Bret said that she loved natural colors mixed with the green hues of nature. She carried this theme seamlessly throughout the wedding, and the result was magazine-worthy. From the woven macrame hanging backdrop for the ceremony, to the draped greenery everywhere, this rustic barn wedding had us swooning. This was our first time photographing a Kempker’s Back 40 barn wedding, and we felt so grateful to Bret and Brandon for introducing us to such a magical place! Scroll down to see some of our favorite documentary photos from their big day. Congrats to these newlyweds and welcome back from your Dominican Republic honeymoon! 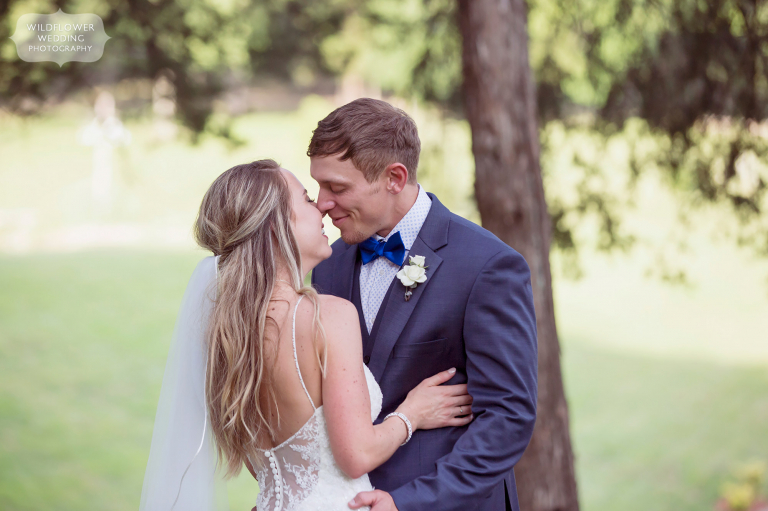 As wedding photographers who specialize in outdoor and rustic weddings, we couldn’t believe that this was our first time at the Kempker’s Back 40 venue. 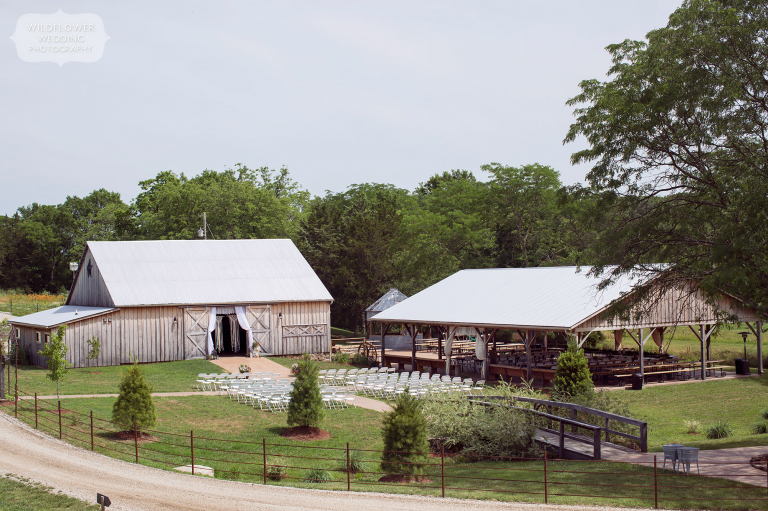 This venue is nestled in the Ozarks area of southern MO. It felt like a hidden gem, and is one most perfectly laid out wedding venues we’ve seen in the Midwest. From the outdoor ceremony space in front of the barn to the covered pavilion with family style picnic tables set up, everything was in one place and created a seamless flow to the day. After the ceremony, Bret and Brandon had their first dance on the outdoor patio under a canopy of string cafe lights. There’s nothing more romantic than dancing under the stars at a wedding! Bret had so many amazing ideas for her wedding. One of our favorites was the handmade macrame curtain that hung behind their ceremony. There were also handwoven macrame table runners that added a super romantic touch to the head dinner table. Lace was draped and hanging throughout the barns and we loved the vintage Mr. and Mrs. chairs. 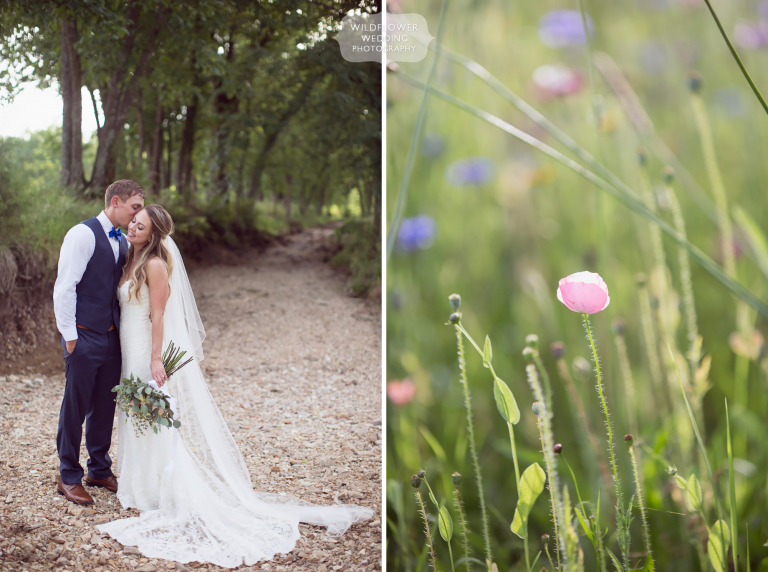 In addition to the picturesque barns, this venue also had a huge field planted with colorful wildflowers. It was the perfect place for sunset portraits of this happy bride and groom. Bride’s necklace – Tiffany & CO.
BestLatasha - I have noticed you don’t monetize your website, don’t waste your traffic, you can earn extra bucks every month.